Rubber flat roof kits are quick to install and offer an incredible service life when installed correctly. Our rubber flat roof kits are also manufactured by leading supplier Classic Bond, helping to ensure your rubber roofing is able to withstand the demands of most weather conditions. 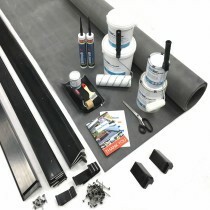 In your rubber flat roof kit you’ll find the membrane itself, adhesives, tool kit and much more. Your kit will also be accompanied by an installation guide, helping you install your flat roof kit with ease. Once installed, you’ll needn’t touch your new EPDM roof for many years due to the use of innovative, durable materials. If you have questions about our range of garage roofing kits, simply call our team on 01295 565565. We will assist you in finding the ideal rubber flat roof kit for you and have it delivered to you quickly. With our price match promise, we’ll also provide you with the best price online.